For the first 44 years of my life, I used every lame excuse in the book to avoid exercise. This worked well for me until I was diagnosed with Parkinson's disease. Within a year, I could barely lift a gallon of milk from the trunk of my car. That scared me. I searched the Internet for a magic pill that might halt or even just slow my disease progression. I might as well have asked Google maps to print directions to Oz so I could get a new brain. It quickly became apparent that if I wanted to live well with Parkinson's, I would have to make exercise part of my daily routine. I adopted the philosophy, "Whatever doesn't kill us, makes us stronger." This left a whole world of exercise open to me, from the exotic -- gait training on an antigravity treadmill -- to the traditional -- swimming. I told myself I was not married to any of these activities. If I didn't find them enjoyable or helpful, I would try something else, with no explanations necessary. One of the first activities I tried was Nintendo's Wii Fit video game and balance board system. It was an easy sell after a neuropsychologist showed videos of people with Parkinson's making significant gains in gait and balance after only eight weeks. As technology has improved, I switched to Microsoft's Xbox360 Kinect. We are not talking vintage Pac Man. You do not sit in a chair and push buttons on a controller. You are the controller, using simple voice commands, hand gestures, and whole body movements to guide the action and mimic the motions that go into performing real activities. If you are a competitive person, you will work up a real sweat boxing and playing table tennis. You have the option to choose whether to play against yourself, a computer player, or a real life opponent, moving to more challenging levels as you master easier ones. I have been known to regularly defeat healthy friends and relatives, and even bowled a perfect 300 game. With my close friend as my swim coach, I transformed myself from someone who "didn't do bathing suits" or put her face in the water to someone who swims half a mile, twice a week? I can swim every stroke, not just the crawl, with pretty good form. Strangers who have watched my progress now call me "the little mermaid" and "Little Fish." Never has my athletic ability in any other sport garnered such praise or positive nicknames. When the not unusual combination of spinal stenosis and Parkinson's left me unable to walk even short distances without intense pain, I feared it would put an end to my favorite activity � mall walking, when the stores are open and my credit cards at the ready. Just breathing the mall air is uplifting, offering an unexpected emotional boost. Focused on preserving what's left of my spine, my physical therapist developed a program that has me using two walking sticks in combination with music to significantly improve my posture, speed, and stamina. In a matter of months, I had my independence and my life back, and have not had another steroid shot, which I had become dependent on for pain relief. Everywhere I go, strangers stop me to ask why I am using two walking sticks rather than one cane, and how they are working for me. Many want to know if I am training for some event. "Yes," I answer, "the rest of my life." Friends and relatives tell me that I am in the best shape of my life, except for the fact that I have Parkinson's. That is no small exception, but is a testament to how well daily exercise has helped me hold the line, and that's big when you are talking about a progressive, debilitating disease. Now I exercise so much that my doctor told me I am "overqualified" for an NIH study looking at the benefits of exercise for people with Parkinson's. My former gym teachers would be turning over in their graves if they heard this. While much research has been and continues to be done regarding exercise and Parkinson's, no one has yet to determine which activities provide "the biggest bang for our buck." Absent any hard and fast guidelines for the optimal degree of intensity, frequency, and duration of our workouts, I have adopted the "splatter gun" approach. 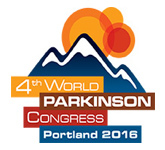 Seeking the new challenges and benefits a higher level work out program brings, I jumped at the opportunity to work with the Brian Grant Foundation in Portland, Oregon, and the 2016 World Parkinson Congress, to introduce the Power Through Project. Details will be announced on August 30. One thing I can tell you is that it is a revolutionary, fun, research-based approach to helping people with Parkinson's "perform to the best of their abilities" and quiet their symptoms.